Alison Luff as Nell Gwynn in ‘Nell Gwynn.’ Photo by Brittany Diliberto, Bee Two Sweet Photography. 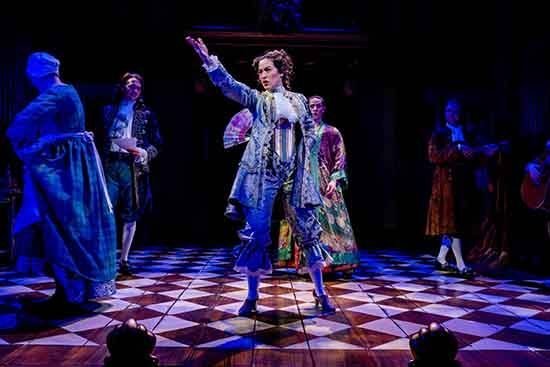 All the world’s a stage, but not everyone has always had access to it, as we are reminded in Jessica Swale’s fantastic “Nell Gwynn,” in a new production at Folger Theatre, directed by Robert Richmond. The 21st century play examines the life and loves of the 17th-century Nell Gwynn, one of the first female actors in English theatre and a favorite mistress of King Charles II. Folger’s production is bold, bawdy entertainment. The curtain opens, appropriately, at the theater. Nell (Alison Luff), an orange seller, defends a beleaguered actor (Alex Michell) attempting to finish a prologue in front of a rather hostile audience. One of the principal actors of the King’s theatre company, Charles Hart (Quinn Franzen), appreciates her bravado and invites her to train as an actor. Having been historically banned from stage performance, women had just been allowed to act onstage due to a decree by Charles II (R.J. Foster). That same monarch appears at one of Nell’s performances and is charmed, asking her to become his mistress, an offer which she initially refuses. Jessica Swale’s script is generously, genuinely witty. Some of the best lines highlight the construction of femininity, onstage and off. “If you’re writing for real women, they won’t need to be so feminine anymore,” one of the actors advises John Dryden (Michael Glenn), the playwright for the troupe (the real Dryden was a prominent literary personage of the era). While paying tribute to 17th-century discourse, dialogue and story are also accessible to modern audiences. Historical context clues are dropped naturally through the show, including England’s recent rule by Oliver Cromwell (a puritan, who closed the theaters during his reign) following the execution of Charles II’s father during England’s civil war. Swale necessarily fictionalizes aspects of Gwynn’s story unavailable in the historical record, especially her pre-stage life as a working-class woman. Folger Theater’s production values are on full display here. The intimate space provides an opportunity to appreciate the silk embroidery of Charles’ waistcoat and the electric blue of Nell’s gown (costumes by Mariah Anzaldo Hale), as well as the regal reds of Tony Cisek’s set, all brought to vivid life by Andrew F. Griffin’s nice lighting design. Alison Luff owns the show as Nell Gwynn. Confident from the beginning, Luff embodies the character’s contradictions and complexities. “We [women] are as naughty and tangly as you are!” she says to Dryden, advising him how to better write women in his plays. Many of her own tangles involve her complicated feelings for Charles II, a suave, seemingly arrogant monarch, used to getting women with the quirk of a quizzical brow. R. J. Foster does an excellent job at underlining the king’s limitations, as well as the man’s real love for the woman who becomes his mistress. While Nell and King Charles have wonderful chemistry, Nell’s primary love story is with the theater. The best scenes of the production showcase the interplay between the not-always-merry band of the theater troupe. Quinn Franzen is sympathetic as Charles Hart, the not-always gracious teacher, and ex-lover, of Nell. Veteran actor Catherine Flye is golden as Nancy, sneaking in sly lines. Christopher Dinolfo gives an enjoyable caustic performance as Edward Kynaston, a principal actor used to playing female roles, aghast at the idea of opening the stage to women. “Who’d come to the theatre to see real people in real life?” he exclaims. Written by a woman, the play also highlights the roles of women usually elided from conventional history, including Nell’s sister, Rose, nicely characterized by Caitlin Cisco. Rose is companion and conscience to Nell, especially in the second half, as Nell’s elevation to the favorite mistress of the king causes her to lose sight of her profession and her family. Regina Aquino also crafts a fully-human performance as Lady Castlemaine, another mistress of Charles, who falls from favor as Nell’s star rises. While the second half certainly brings more complications, as Nell navigates her new power, it also brings even more laughs, culminating in a penultimate scene that is sidesplitting. And as is appropriate, Nell ends on the stage, getting the last word. “Write me a character!” Nell exclaims to the playwright Dryden, early in the show, exasperated by his limited perception of women’s experience. Thankfully, Swale did, and Folger’s production would certainly entertain Nell Gwynn herself. Running Time: About 2 1/2 hours with one 15-minute intermission. “Nell Gwynn” runs through March 10 at Folger Theatre. For tickets or more information, click here. Norah is a writer and editor. She was a teacher for six years, four of which were spent in South Korea. While she will always miss having kimchi on demand, she is happy to be closer to family. She also enjoys dance, graphic design, and BBC dramas.